US Federal Communications Commission chairman Tom Wheeler has issued his most damning indictment of America's broadband infrastructure to date – claiming more than half of citizens have only one ISP in their area offering 25Mbps or faster connections, and that competition has been crippled by a telecoms duopoly. "The simple lesson of history is that competition drives deployment and network innovation," he said. "That was true yesterday and it will be true tomorrow. Our challenge is to keep that competition alive and growing." Wheeler pointed out that today's state of wired broadband access was failing many Americans. The FCC rates a 4Mbps line as "broadband," but noted this wasn't sufficient for services like Netflix, which recommends at least a 5Mbps download speed as the minimum required for a decent streaming experience. But 6.3 per cent of the US market can't even get a 4Mbps connection, and 18.9 per cent can get it but only from one supplier. Only 60 per cent of consumers are limited to a choice between only two suppliers, and the barriers to switching between them are high, Wheeler said, since this usually means swapping out cable equipment for a DSL connection. "As a result, even though there may be competition, the marketplace may not be offering consumers competitive opportunities to change providers, especially once they've signed up with a provider in the first place," he said. 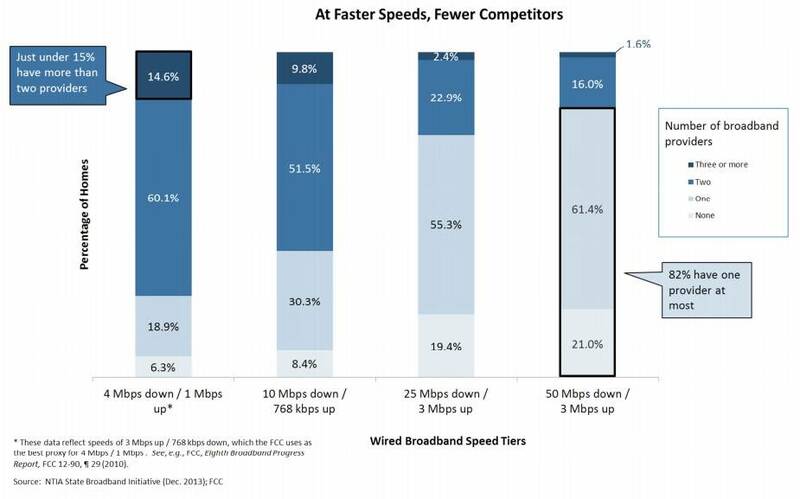 When it comes to a 25Mbps connection, something Wheeler said was "table stakes" for modern internet provision, the competitive landscape is even worse. About 55 per cent of consumers only have one choice of provider and almost a fifth of the country simply can't get those speeds at any price. As for 50Mbps connections, over 82 per cent of consumers have no choice of ISP, with 16 per cent having a choice between two providers. Wheeler pointed out that in places where competition existed, internet speeds were getting faster quickly. Once Google announced its Fiber projects in Austin and Kansas City, the existing ISPs decided they could offer those kinds of speeds too, but were only really doing so in places where they faced competition in the market. By far the luckiest Americans are those living in cities, Wheeler said, since they have the largest number of suppliers to choose from. As a result speeds were typically three times faster for city dwellers in comparison to their country cousins. As a result, the FCC will be doing what it can to foster competition in the US broadband market, Wheeler promised. The agency was looking closely at laws in 20 US states that forbid municipal areas from forming their own broadband networks and is considering granting them exemptions in the name of competition. The FCC will also be looking at the last-mile service providers to make sure they can't shut out competition, Wheeler said, and the agency will be pushing for greater investment in rural areas to ensure the countryside is as well connected as cities. Wheeler's remarks brought a quick response from the National Cable and Telecommunications Association, which said that its figures showed 85 per cent of Americans had access to at least one 100Mbps connection and claimed that the industry has spent $230bn since 1996 building out its networks. "Chairman Wheeler's remarks about broadband competition underscore the importance of maintaining a light regulatory touch that encourages more investment from more companies," the NCTA, which represents telcos, said in a statement.